“This is a bold step, but it’s not surprising. As a representative of the nation’s third largest dairy producing district, and as a co-chair of the Congressional Dairy Caucus in the U.S. House of Representatives, Rep. Simpson understands the challenges. He knows what it takes to safeguard the economic well-being of the dairy industry in Idaho and across the U.S.,” says Mike Roth, dairy producer President of IDA. Last March, Idaho dairy producers voted to recommend a dramatic reform package – Foundation for the Future (FFTF) – which served as the model for the Dairy Security Act of 2011. During that vote, 86 percent of Idaho’s dairy producers were represented. FFTF is an effort spearheaded by dairy producers and cooperative members of the National Milk Producers Federation. The new bill promotes, and in some areas, expands components of the dairy industry plan. Like FFTF, the Dairy Security Act includes a voluntary margin insurance program and a Dairy Market Stabilization Program, which work together to encourage lower milk production during periods of declining market demand and low margins. IDA calls on the nation’s dairy producers to rally their support behind Dairy Security Act of 2011. “I urge fellow Idaho dairy producers to attend the upcoming IDA Annual Meeting in Boise on Nov. 9-10, to learn more about this bill and other issues affecting this state and national dairy industry,” says Roth. The Idaho Dairymen’s Association (IDA), based in Twin Falls, ID, was established to continue to develop and sustain an economically viable Idaho dairy industry that works together to achieve success in the domestic and global marketplace in meeting the needs of the Idaho dairy farm families. 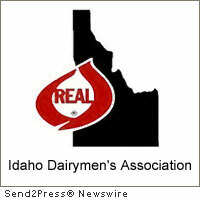 Founded in 1944, IDA represents all dairy producers within the state of Idaho. For more information, visit http://idahodairymens.org .